Making the most of your oven makes economic and practical sense. Once you have got used to utilising the heat of the oven for more than one meal at a time you will wonder how much time and energy you wasted before! Even if you are not on a tight budget, nobody likes paying more for something than they have to, and every body likes to save time, so read the following ideas for making the most of your oven and you will be able to give yourself a pat on the back for being thrifty! When you need to have a hot oven for cooking or baking, be judicious with your timings. Once you get to know your oven you will know how long it takes to warm up to the desired temperature – there is no point heating up your oven for one hour when it only takes twenty minutes to get up to temperature. Plan your cooking timings so that you have the oven on for the least amount of time possible. If you need convincing as to why, watch your electricity meter next time you switch the oven on and you will see it whizzing round. If you need to get your oven to a particularly high temperature, why not make the most of the oven as it heats? There are all sorts you can do – if you make jams, jellies or anything else that needs to be stored in sterilised jars, put the jars into the cold oven and leave them in there while it heats up. Take them out when you need the oven and they will be sterilised – they will also be very hot, so make sure you use a cloth! You can also cook par boiled vegetables in the oven as it heats – just toss them in a little olive oil, maybe with some chilli and garlic and have them all in one layer on a baking tray. By the time you are ready to use the oven they will be lovely, Mediterranean roasted vegetables perfect for stirring through pasta or using as a dip with bread sticks. 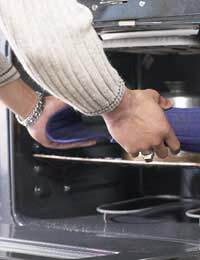 When you are cooking your dish in the oven, you can also use the rest of the oven space. There are always a few potatoes or sweet potatoes lying around in the kitchen vegetable rack – prick them with a fork and rub with olive oil and throw them in the hot oven. If you don’t want to eat them now, take them to work for lunch the next day, or scoop out the potato and make mash for the freezer. You can also use the residual heat of the oven as it cools down. The cooling heat is perfect for making meringues or American-style baked cheesecakes. The still-warm oven is also a great place to store your baking sheets and roasting tins – the heat will dry the tins and save space on the draining board – just remember to take them out before the next time you turn the oven on!